1. Detach the speed restriction label (0) from the sealant bottle (1), and place it in a highly visible place inside the vehicle such as on the steering wheel to remind the driver not to drive too fast. 2. Screw connection hose (9) onto the connector of the sealant bottle. 3. Ensure that screw cap (8) is closed. 4. Unscrew the valve cap from the valve of the defective wheel and screw filling hose (2) of the sealant bottle onto the valve. 5. Insert the sealant bottle into the housing (4) of the compressor so that the bottle is upright. 8. With the engine start/stop button position on or ignition switch position on, switch on the compressor and let it run for approximately 5~7 minutes to fill the sealant up to proper pressure. (refer to the Tire and Wheels, chapter 8). 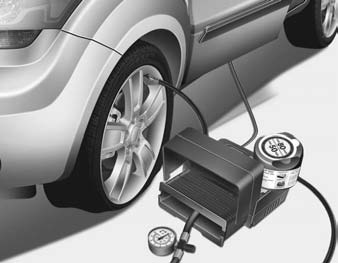 The inflation pressure of the tire after filling is unimportant and will be checked/corrected later. Do not attempt to drive your vehicle if the tire pressure is below 29 PSI(200kpa). This could result in an accident due to sudden tire failure.